If you get close enough to see it, many insect eyes have a small black spot that follows your every move. This mantis makes a great example. How does the mantis do that? It's an optical effect. Not an illusion, mind you -- there really is a small black spot that moves around on the surface of the eye. The catch is, the small black spot is not some physical structure that's moving, it's just the set of ommatidia (facets of the compound eye) that happen to be facing in the direction of the observer -- either your eyes or the camera. This has one fascinating effect, though. If you look at the mantis eye through a stereo microscope, then each of your eyes sees the black spot in a different position. 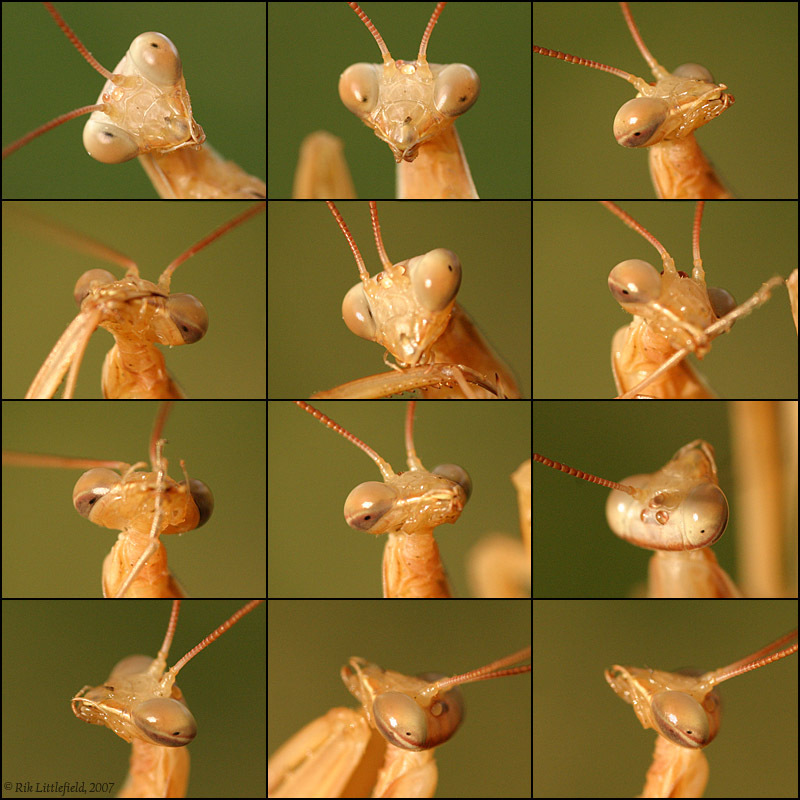 Your brain then proceeds to interpret the different positions as parallax caused by depth, and what you see looks for all the world like the mantis's compound eyes are big transparent balls, with the black spots painted on the inside of the eyes' back surfaces! Now that's an illusion -- and a very bizarre but convincing one! Technical: Canon 300D, Sigma 105 mm at 1:1, natural light, cropped. Captive mantis. Very interesting montage, thanks! (and I got an "error 500" when I tried to access it first time). Thanks, Mike, for both comments. BTW, I just noticed that the two frames in the lower right corner actually make a usable stereo pair (crossed-eye), if you concentrate on just the eye and ignore the legs and antennae. I'll try to get a better stereo pair tomorrow, but no promises -- it's a challenging problem. Great photo sequence, displaying the effect very nice indeed. I mostly see it on dragonflies, and I've read that there infact should be I think six secondary spots around the main spot. They are probably hard to see though. I must say that when I've held a dragonfly in my hands with very big eyes, and moved it very close to my own eyes, the surface seems to float too. Maybe the same effect. btw. the pose in the upper left picture is awesome. Oh yes, very alive. That's why it's challenging to get a stereo pair, given that I don't have a camera that will shoot both pictures at the same instant. I've read that there infact should be I think six secondary spots around the main spot. They are probably hard to see though. ... I must say that when I've held a dragonfly in my hands with very big eyes, and moved it very close to my own eyes, the surface seems to float too. Maybe the same effect. I think dragonfly eyes and mantis eyes are slightly different. I have only been able to find the one black spot in this mantis. (See larger image here.) Many butterflies, on the other hand, have numerous fuzzy dark spots that behave roughly the same way. The size, sharpness, and number of the spots may have to do with the resolution of the eyes, but this is just my speculation -- I have not read anything about it. A follow-up posting, showing the spots as a stereo pair, can be found HERE. 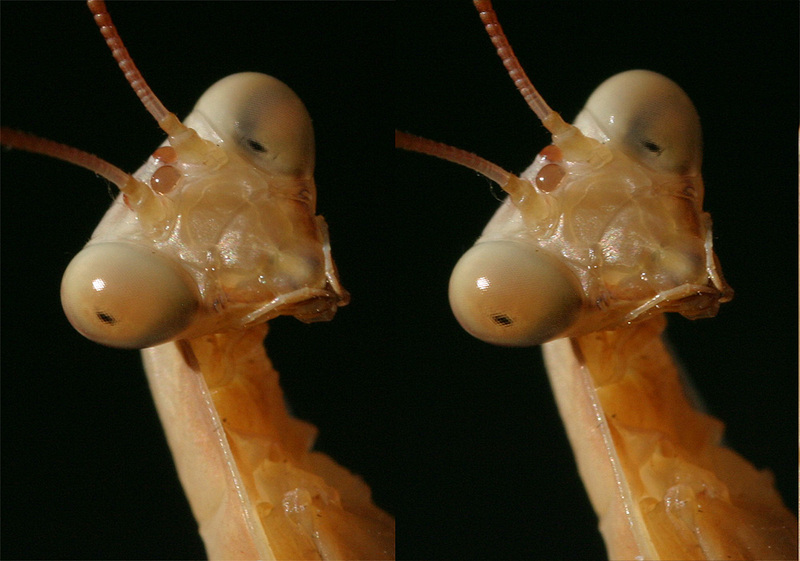 The effect of the paying mantis coumpound eyes is called "pseudopupil" and it is an optical ilusion created because the omatidia aligned with the observer absorb the light while the non aligned omatidia reflect the light, creating a curious effect. Great piece of work there. Thanks for the brief explanation, didn't knew that!